Three Birmingham-based artists will see their work become the focus of a new research and art exhibition that opens in Oxford on Tuesday 24 October, highlighting how multilingualism is producing new forms of expression within the creative arts in the UK. Informed by cutting-edge research at Birmingham City University and the University of Oxford, ‘Slanguages’ explores the work of Rinkoo Barpaga – a Deaf comedian and film maker who has created his own urban sign language, grime musician RTKAL and Nigeria’s first Grammy Award winner, percussionist Lekan Babalola. All three Birmingham-based performers use ‘insider’ and community languages – or ‘slanguages’ – in their musical and artistic work, and the new exhibition at Wolfson College displays aspects of their archives and ephemera that highlights their cultural significance, as they constantly push the boundaries of British urban culture. The exhibition has been co-curated by Birmingham City University’s Professor Rajinder Dudrah and Punch Records, an award-winning music development agency also based in Birmingham. Professor Dudrah leads the research project Creative Economy, part of a major national study into the interaction between languages in the performing arts and the types of creativity this generates. “Research for the ‘Slanguages’ exhibition and our wider Creative Economy study has already revealed a range of languages being used by the performer, both for communication purposes and artistic development. These include West African languages, Caribbean Patois, pidgin and the creation of a new urban form of sign language. Professor Dudrah’s research strand forms part of Creative Multilingualism, a UK-wide £4 million four-year research programme investigating the interconnection between linguistic diversity and creativity, and is funded by the Arts & Humanities Research Council’s (AHRC). The research is being conducted in the context of an unprecedented crisis in language learning in UK schools, which is in turn undermining the health of Modern Languages departments in universities. The crisis has many causes, but the bigger picture is globalisation and the gradual rise of English. The programme is designed to develop a new model for Modern Languages in the UK that is predicated on the intrinsic connection between multilingualism and creativity. This has the potential for giving learners confidence in their innate ability as linguists, and it makes language learning lastingly rewarding. It also holds the key to establishing a common identity for the subject of Modern Languages across educational sectors. Visitors to the ‘Slanguages’ launch party on Tuesday 24 October will be able to find out more about the overall project and the Creative Economy strand, as well as enjoy performances from artists involved in the project. 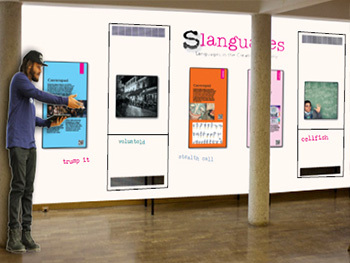 ‘Slanguages’ will run at The Buttery, Wolfson College, University of Oxford until 12 December. The exhibition is open daily 9.30am-5pm, subject to College commitments. Visitors are advised to check with the Lodge Reception before coming to view. Admission is free. Find out more about Creative Multilingualism via the research programme’s website, Twitter feed or Facebook page. LinguaMania image courtesy of Ian Wallman.